When in doubt, simulate. That was my second takeaway from Fed Chair Janet Yellen’s highly anticipated Jackson Hole speech on Friday. The first takeaway was the one that made all the headlines. She is joining the chorus of Fed officials who have been saying it is time for another rate hike: “Indeed, in light of the continued solid performance of the labor market and our outlook for economic activity and inflation, I believe the case for an increase in the federal funds rate has strengthened in recent months.” That seems to be the Fed’s new party line, as recently also expressed by Fed Vice Chair Stanley Fischer and FRB regional presidents William Dudley (NY), John Williams (SF), Dennis Lockhart (ATL), and Loretta Mester (CLE). Then she really let us have it by offering a chart of the Fed’s known unknown. 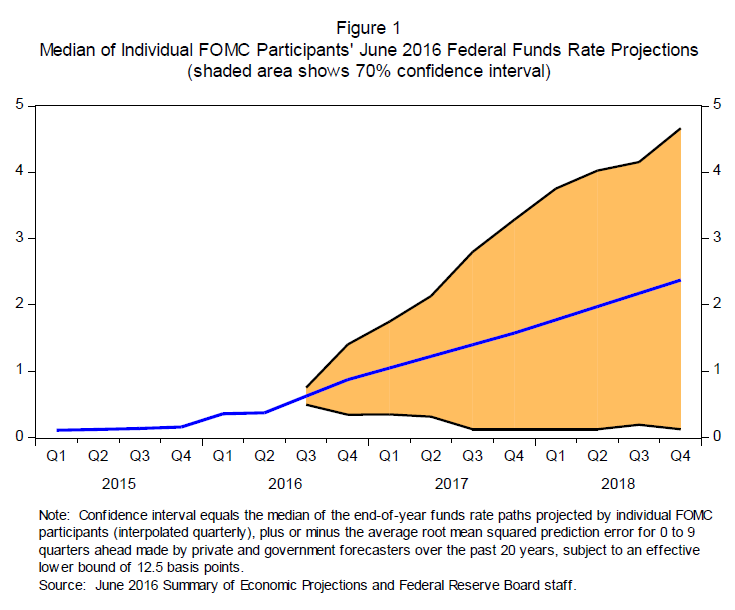 It shows a line tracing the median path for the federal funds rate through the end of 2018 based on the FOMC’s summary of economic projections in June. Its Figure 1 also shows a shaded region on either side of the line, which is based on the historical accuracy of private and government forecasters. The amazing result is that there is a 70% probability that the federal funds rate will be between zero and 3-1/4% at the end of next year and between zero and 4-1/2% at the end of 2018! Yellen may be test-marketing this “fan chart” to replace the quarterly “dot plot” of the federal funds rate reflecting the forecasts of the FOMC participants. Yellen provided the following explanation for her drive-a-convoy-of-trucks-through range for the federal funds rate outlook: “The reason for the wide range is that the economy is frequently buffeted by shocks and thus rarely evolves as predicted. When shocks occur and the economic outlook changes, monetary policy needs to adjust. What we do know, however, is that we want a policy toolkit that will allow us to respond to a wide range of possible conditions.” Fed officials call that “forward guidance.” In other words, we are on our own. (1) Post-crisis toolkit. Yellen noted that in 2006, Congress approved plans to allow the Fed to pay interest on banks’ reserve balances beginning in 2011. In the fall of 2008, Congress moved up the effective date of this authority to October 2008. She stated, “That authority was essential. Paying interest on reserve balances enables the Fed to break the strong link between the quantity of reserves and the level of the federal funds rate and, in turn, allows the Federal Reserve to control short-term interest rates when reserves are plentiful.” They certainly were plentiful, as the Fed implemented a series of QE programs starting in November 2008. Yellen also touted “forward guidance” as another new post-crisis tool in the toolkit. (2) Too close to zero. Until very recently, the Fed was focused on “normalizing” monetary policy very gradually so as not to undermine what seems like self-sustaining economic growth. Now, the Fed is starting to worry about the next recession and whether there will be enough room between the federal funds rate and zero to stimulate the economy. Yellen observed that most forecasts currently show the federal funds rate rising no higher than 3% in the longer run. Between 1965 and 2000, it averaged more than 7%. “Thus, we expect to have less scope for interest rate cuts than we have had historically,” Yellen stated. (3) Why so low? The reason that the federal funds rate isn’t expected to rise any higher than 3% is because inflation is expected to stabilize around 2%, while the “neutral” real federal funds rate is expected to be only 1%. Get it? 1+2=3. During past economic expansions, the real rate seemed to be more like 2%-3%. The real rate is supposed to be the federal funds rate minus expected inflation, which is hard to measure. There are survey data for expected inflation. There is also the yield spread between the 10-year nominal bond yield and the comparable TIPS. In my opinion, it doesn’t make much sense to use expected inflation over the next several years to inflation-adjust an interest rate that is for funds borrowed and deposited overnight by bankers. So I use the actual core CPI inflation rate instead. Or as Stanley Fischer recently admitted in his 8/21 speech on the slowdown in productivity: “We just don’t know.” Indeed, no one even knows if the neutral real rate concept makes any sense whatsoever. It can be lumped together with the Loch Ness monster, leprechauns, unicorns, and UFOs. None of them have ever been convincingly sighted by sober observers. Some sober critics of the Fed and other central banks have observed that by keeping interest rates near zero, monetary policy may be an important source of secular stagnation, which is why the real rate is so low. Savers are earning less and are forced to save more. Corporations are using cheap money to buy back their shares rather than invest. Zombie companies that should be out of business are able to stay in business by refinancing at low rates and keeping their excess capacity on line, depressing prices and profits. And on the fiscal side, a significant portion of the government’s budget deficit is financing entitlement programs rather than infrastructure spending. The monetary authorities are enabling the fiscal authorities to do this at very low interest rates. Burdensome taxes and regulations may also be contributing to secular stagnation in the US and around the world. (4) Fun with econometric models. 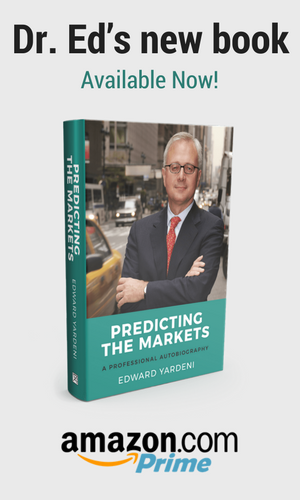 When reality bites the forecasts of macroeconomists, they don’t curl up in a ball and mutter quietly to themselves in the corner. Instead, they simulate reality with their econometric models and show why they are right after all, at least in their simulated world. In her speech, Yellen acknowledged that a 3% federal funds rate (assuming that it ever gets there again in our lifetime) may not leave enough room to ease during the next average-style recession, based on previous experience. Not to worry: A recent Fed working paper is reassuring, at least to Yellen. It is by David Reifschneider and titled “Gauging the Ability of the FOMC to Respond to Future Recessions.” Its conclusion is very reminiscent of arguments made by both William Dudley and former Federal Reserve Chair Ben Bernanke for QE2 during November 2010. They both said that the Fed’s econometric model showed that the federal funds rate needed to be lower than zero. But the Fed’s mantra back then and still now is that zero is the “zero bound.” Negative interest rates remain off the table (for now). (5) Other options. No wonder that Yellen is reaching out to her staff and other economists for more tools to run monetary policy. Interestingly, in her speech, she didn’t mention negative interest rates. She did mention that QE purchases could be broadened to other assets. Might that include corporate bonds and equities? She didn’t say. Yellen did mention raising the 2% inflation target, as some economists have advocated. Sorry, I think that’s nutty. The Fed can’t even get it up to 2%; why would Fed officials want to embarrass themselves by raising the bar? She mentioned that fiscal policy could play a role, but stayed clear of suggesting helicopter money. Is that clear? Well, in any event, I reviewed the relationships between the real federal funds rate (using the current core CPI inflation rate) and the variables mentioned by Yellen as possibly explaining why the real rate is low. I didn’t find much when I compared the real rate to the growth rate of the US working-age population, US productivity growth, the US personal saving rate, and the capacity utilization rate.